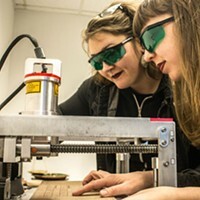 A pinhole-photography show leans toward the woods. 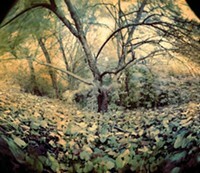 Pinhole exploits the medium's capacity for the dreamy. Field day: "Untitled #5," a photograph by Sarah Shank. What is it about pinhole photography that makes people want to lie down in the grass? 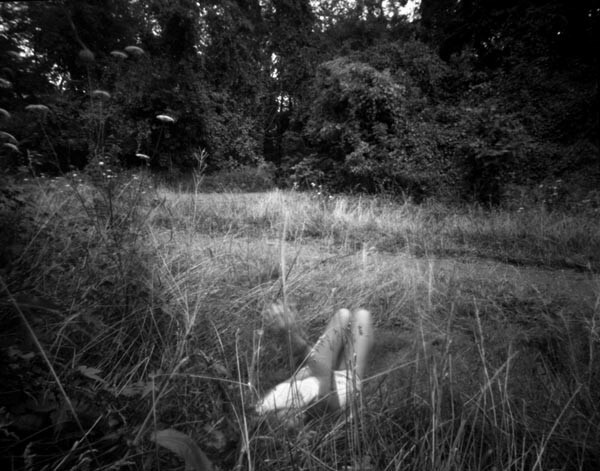 In Pinhole, a group show at the Irma Freeman Center for Imagination, about half the images either have subjects (usually young women) recumbent in nature, or were taken from such a low angle that the photographer must have been similarly positioned. One answer: This low-tech form of photography, typically managed with simple, hand-crafted (and often lensless) cameras, is a superb way to photograph nature. In Through the Pinhole, curated by Sue Abramson, perhaps the best examples are the gorgeous works by Karen Kaighin. "Light Wood," shot in a copse; the wide-angled "Tree"; and "Weeds" all employ such pinhole hallmarks as exceptional depth of field and the haziness and slight blurring that come with long exposure times, to recreate that relaxed but deeply aware feeling you get in the woods. Similarly, Christina Labrise's bug's-eye-view images of people and plants evoke a vernal idyll. Sarah Shank's high-contrast black-and white prints suggest narrative; in one, a young woman in middle distance, on a wooded and wildflowered path, is double-exposed, facing both to her right and away from us at once. With "Fragmented," Julie Gonzalez also pushes narrativeward, with five images of mostly recumbent women in the woods vivified by a range of exposure times and other striking effects. Other photographers find other ways to capture the outside world. Chad Djubek's paired daguerrotypes, in artfully antiqued frames, seems to freeze two plant specimens in ice. Bob Kubiak tweaks the technology with "digital pinhole" images of starkly un-peopled urban landscapes. And Laura Jean Kohl's "Refrigerator Box Camera Obscura" cleverly employs the dented box/camera itself — light-sealed with trash bags and duct tape — as the display module (though her photos are less interesting than the technique). Elizabeth Raynes Griffin takes things indoors, and further into dreamland, with her soft-focus images of theatrically posed women. There's an exquisite-corpse surrealism to diptychs of a woman whose legs are replaced by empty stockings; another subject, fully dressed up top, is given bare legs outfitted with swim fins. Rounding out Pinhole is some nearly abstract work. Allen Benson's "Structures" is a study of wheels and other spoked forms, while Brian Conley's series "The Life of A Candle" turns documentation into a Rorschach test.